Yogassage is a recently coined term that combines the notions of yoga and massage. Yogassage is often used to refer to yoga that is practiced with a partner. Practicing yoga with a partner—whether a loved one or a workout mate—can be a lot of fun. In addition, you can get an even better stretch and other enhanced benefits when someone helps you go more deeply into a yoga posture. 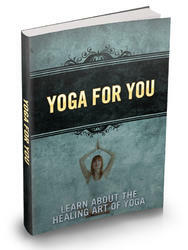 For this reason, there is a separate chapter in Yoga for Men titled "Partnered Yoga" (Chapter 15) devoted to this subject—complete with illustrated instructions on representative partnered yoga exercises. Learn About The Healing Art Of Yoga. We need to give more importance to our health and the treatment of diseases. A big number of medicines treat only the symptoms of the disease, and not the base cause. As a matter of fact, the cause of a lot of chronic ailments is still being researched.